Debbie Daugherty was driving home from work shortly before Christmas a couple years back when she noticed a U.S. Marine Corps Toys for Tots program truck. The soldiers collecting donations made her think of her father, a decorated veteran who served 30 years in the Marines, including tours in WWII, Korea and Vietnam. He'd been having health issues, and had moved in with Daugherty. She decided to ask the soldiers for a favor. "I did a U-turn, drove back to them, and asked if they'd follow me home, give me two minutes of their time, and say hello to my dad," says Daugherty, director of Administrative Services at Mayo Clinic's Florida campus. "I thought they'd think I was crazy." Instead, "They said 'Yes, Ma'am,' and followed me home." That two-minute request stretched into a two-hour visit, during which Daugherty saw "a whole change in my dad's countenance. He just beamed." As did a light bulb in her head. "I thought, 'Wouldn't it be nice if we could bring that to our patients?'" 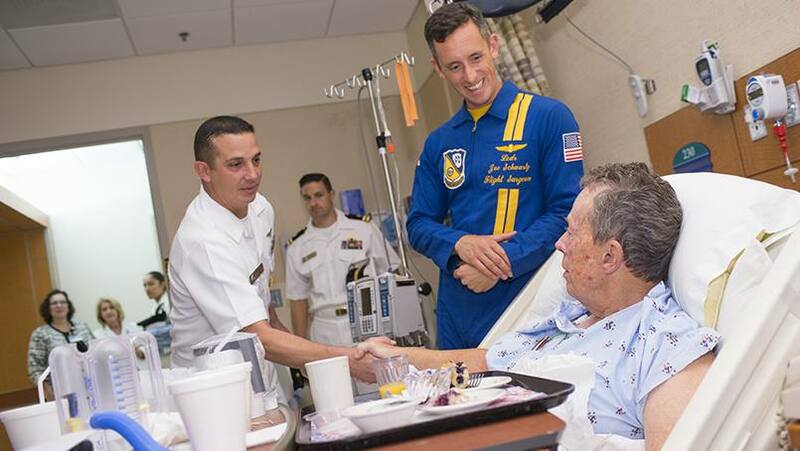 That experience served as the genesis for the Visit a Veteran Program at Mayo Clinic's Florida campus. Daugherty helped launch the program in 2014, and since then, volunteers have made 776 visits to hospitalized veterans. The visits are a big hit with patients, who "are so thankful to know that someone cares about their service," Daugherty says. Many of the volunteers are veterans themselves, and the experience "gives them a sense of camaraderie and a chance to give back to other vets." The visits make a difference to patients' families, as well. "Usually they beam," Daugherty says, "but sometimes they cry." Mayo staff have been supportive of the program and have suggested additional ways to recognize veterans. "One doctor told me, 'When I walk into a room, I want to know if the patient is a vet,'" Daugherty says. That request led to the creation of small signs placed near a patient's headboard that read "I served" next to the symbol of the branch in which the patient served. The hospital also gives thank you cards and small pillows with patriotic fabric to veterans. "We try to keep coming up with new ideas to show our appreciation," says Daugherty. One new effort comes from a small group of colleagues in the Cardiology Clinic. Mary Alleyne, Carolyn Croy and Leida Perez all have a connection to the military and share a love of quilting. They recently completed a patriotic quilt they plan to donate to a patient who is a vet, specifically one who doesn't receive visitors. Daugherty tells us she's "proud to be part of an institution that recognizes people who have volunteered to serve our country." And she's looking for more people willing to help get that message across. "I'd love to see the number of visits double," she says. "It's pure joy to see how patients light up when they realize that Mayo cares. How can you not walk away feeling good after that?" Indeed. You can share your comments below. Then, use the social media tools atop this page to share this story with others. What a great idea. As a daughter of Veteran they deserve to be respected and thanked for their service . I am a Navy vet from the Viet Nam war (Ret CDR aviator), and also a liver and kidney transplant recipient Oct 2012). I would like to get involved with the program. I live in North Jax / Amelia Island and can visit with short notice.. I would be honored to be a volunteer.